Author and yoga teacher Ananda Leeke's #ThrivingMindfully podcast encourages and inspires you to incorporate more mindful moments into your daily life. 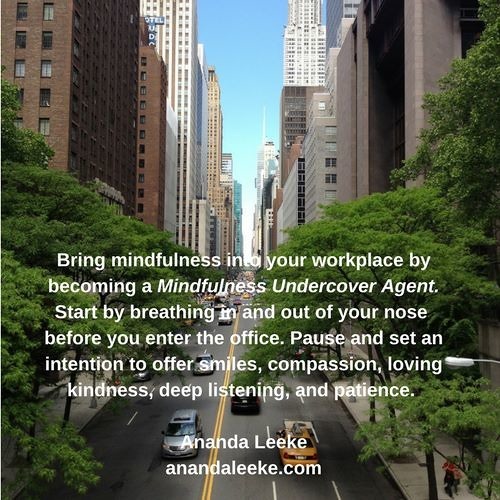 Listen to today's episode that encourages you to bring mindfulness into your workplace by becoming a Mindfulness Undercover Agent. Looking for a mindful online community? Join A Mindful Cup of Tea Facebook group for weekly mindful moments and discussions: www.facebook.com/groups/MindfulCupofTea. Visit http://anandaleeke.com to learn more about her #ThrivingMindfully journey as an author, artist, digital storyteller and strategist, speaker, and yoga teacher. Explore her world through her words and experiences in her books "Love's Troubadours" (yoga-inspired novel), "That Which Awakens Me" (creativity and mindfulness memoir), and "Digital Sisterhood" (tech and mindfulness memoir): http://amazon.com/author/anandaleeke.